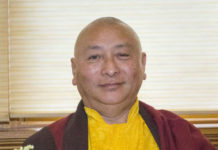 Bardor Tulku is a prominent Karma Kagyu teacher and leader. In 1977, His Holiness Karmapa asked Bardor Tulku to help establish Karma Triyana Dharmachakra (KTD) in Woodstock, New York, the Karmapa's seat in North America. Bardor Tulku Rinpoche continues to live and teach at his center, Kunzang Palchen Ling, in upstate New York.